Sun, sand and sea; the body rumbling exhilaration of professional racing and Bike Week, world class golf... Daytona Beach is the place to take all of your senses to the extreme!! The Daytona Beach DestinationTM Bracelet is a tribute in precious metals to the ultimate beach experience, with the thrill of championship motor sports at the center of the fun. Known as the "World's Most Famous Beach" since the 1920's, Daytona also has a reputation for thrills and also holds the title of the "Birthplace of Speed". 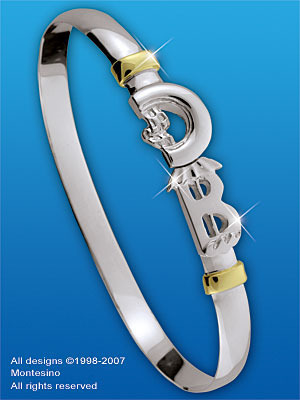 The Daytona Beach DestinationTM Bracelet signifies a playful and thrilling spirit with a "D" forged in the likeness of a racing slick with a checkered flag accent, and a relaxing spirit is represented by a "B" emblazoned with a lone beach umbrella. The union of the two symbolizes the "Hook" that Daytona has on the hearts of millions and the two 14 karat gold wraps represent the Atlantic and the ICW, between which, it all happens. Celebrate Daytona Beach... wear the Daytona Beach DestinationTM Bracelet... a true symbolic treasure!